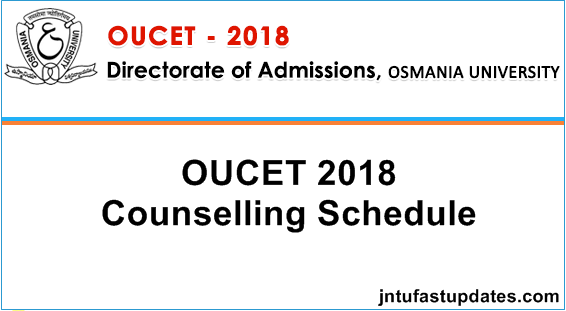 OUCET 3rd Phase Counselling Dates 2018: Osmania university has announced OUCET 3rd Phase Counselling Dates Rank Wise, Course/Subject wise. The Qualified candidates can check and attend For Certificate Verification as per schedule. For details of procedure to be followed and other relevant information please read instructions to the candidate placed in the website cv.ouadmissions.com. The qualified candidates of OUCET-2018 are hereby informed that the final phase of certificate verification, exercising of web options and manual counseling will commence from 28.08.2018. The online payment for fresh registrations will be open from 25.08.2018 for those who did not registered earlier. All the candidates have to exercise their web options freshly for possible sliding and for new admissions. The candidates of OUCET–2018 who have not attended for first phase certificate verification shall get their certificates verified from any of the decentralised verification centres. The candidates who did not pay registration fee in first phase should pay the registration fee of Rs.250/- for OC/BC candidates and Rs.200/- for SC/ST/PH candidates has to be paid by candidate through online payment mode before proceeding to certificate verification, which is mandatory. Only those candidates who paid registration fee are allowed for certificate verification at various centres. Note: 1. The candidates who not got their certificates verified in the first phase have to attend for Certificate Verification in any nearest verification centre. SIR MY RANK IN ou cet WAS 4113 . I HAVE APPLIED FOR M.Sc(maths). I WENT FOR COUNSELLING IN THE MONTH OF JULY , I GOT MY CERTIFICATES VERIFIED IN THE FIRST PHASE OF COUNSELLING AND THEN I OPTED FOR FEW COLLEGES THEN LATER THEY SAID THAT IT WAS CANCELLED AND APPLY WEB OPTIONS AGAIN I OPTED FEW COLLEGES. TILL NOW I DID NOT GET ANY INFORMATION REGARDING THE COLLEGE WHICH IS ALLOTTED FOR ME .SO WHAT SHOULD I DO. PLEASE SUGGEST ME TO WHOM I SHOULD CONSULT. I AM REALLY WORRIED A LOT REGARDING THIS ISSUE. sir 2nd phase lo naku seat vachindi kani naku a clg istam ledu so nenu 3rd phase lo web options petukunta 3rd phase lo seat vasthe malli ou ki velli provisional allotment order tisukovala sir….